Lauki, which is also known by a variety of other names like bottle gourd, calabash gourd, doodhi and ghiya, (Sorekai/Chorakkai) in Tamil, ‘Chorakaa‘ in Malayalam,(Sorakaya/Anapa Kaya) in Telugu,(Sorekai/Esugai Balli) in Kannada, ‘Lau‘ in Bengali, ‘Dudhi‘ in Gujarati, (Pandharabhopla / Dudya Bhopal) in Marathi and ‘Ghia Da Sag‘ in Punjabi. Lauki is a staple item as far as Indian cuisine is concerned. It is a vegetable with pale, smooth and waxy green surface and white spongy pulp. The juice of lauki is consumed by thousands of people because they believe that it would benefit their health in many ways. As lauki contains almost 96% of water, it is perfect for juice extraction. It is readily available in the market and is affordable too! Moreover, extracting the juice from lauki is not at all difficult. Lauki juice is rich in Vitamin C, Vitamin B, sodium, iron and potassium. It has low fat and cholesterol level. As a result, this anti-oxidant drink is quite popular among health conscious individuals. Did you know that every cup of lauki juice that you drink contains 26 mg of Vitamin C? Vitamin C, which is an active antioxidant, protects the cells from being damaged. It also prevents DNA oxidation. Moreover, it boosts the production of collagen. Zinc, which is an essential mineral, is amply present in lauki juice. In fact, with every cup of bottle gourd juice that you drink, you supply your body with about 1.8 mg of zinc. Zinc is helpful in maintaining healthy functioning of cells and regulation of hormones in the body. 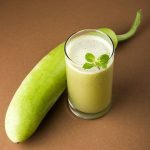 Bottle gourd juice is popular among those who want to lose weight. All you need to do is peel the skin of a fresh lauki, cut it into little pieces, put it in a juicer and prepare the juice. Have this juice regularly to reduce your weight. As this juice is loaded with vitamins, potassium and iron, it is extremely nutritious. Moreover, this juice is believed to curb your appetite if you can manage to drink it in the morning on an empty stomach. Bottle gourd contains not only soluble fiber, but also insoluble fiber along with high water content. Lauki juice is beneficial for improving the digestive system. Drinking lauki juice is known to treat constipation effectively. It also helps in treating problems related to digestive system like acidity and flatulence. Since lauki juice is rich in water content, it provides a cooling to the body, which help to replenish the water lost in the form of sweat. It is an absolute must-have during summers! Since it is diuretic in nature, lauki juice flushes out the excess water content from the body. Lauki juice becomes even more effective when a spoon of lime juice is added to it before consumption. If you are suffering from insomnia, try mixing sesame oil with lauki juice. It is known to help you sleep better. If you are suffering from health issues like profuse sweating, fatigue or diarrhea, then drinking a glass of lauki juice would prove to be extremely good for you. Lauki juice naturally helps to replace the water content lost and at the same time, controls extreme thirst, which is common among diabetic patients. It revitalizes you by replenishing the loss of water. 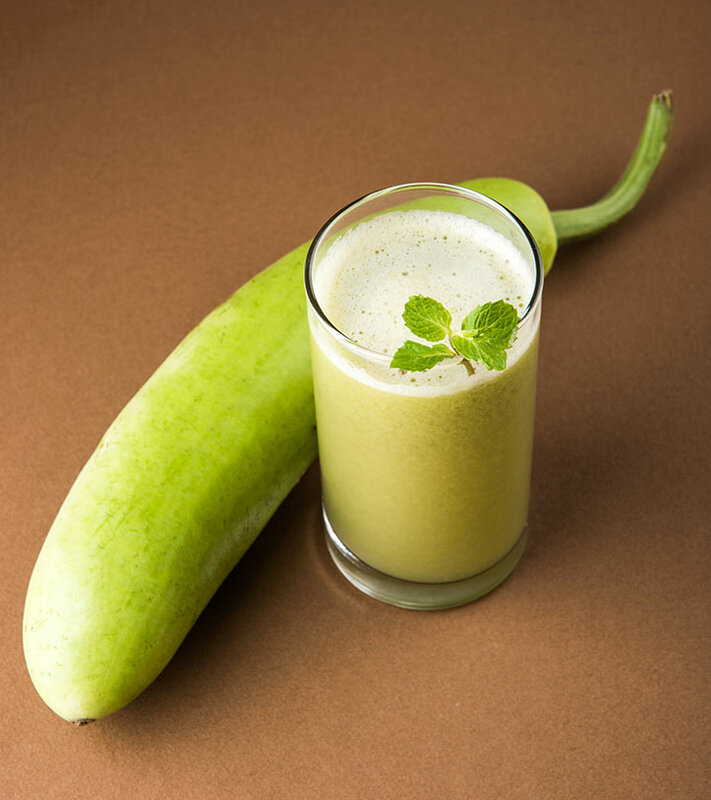 Drinking bottle gourd juice helps you to keep the heart healthy by regulating the blood pressure. Ayurveda recommends drinking lauki juice for reducing inflammation of the liver. Take a small lauki, about 250 or 300 grams in weight. Wash the lauki thoroughly to do away with any surface impurity. Peel the lauki and cut it into small pieces. If possible, taste a small piece to find out if the bottle gourd tastes bitter. Add five or six mint leaves. Add a bit of water and put it in the blender. Once it is done, add a spoon of cumin powder, two spoons of black pepper powder and salt to taste. Stir well and add a few ice cubes. Just follow this recipe and you too will become a fan of lauki juice! If you regularly drink lauki juice early in the morning, chances are that you would not get premature grey hair. Since lauki juice internally cleanses your system, it helps to promote good skin by keeping pimples away and by balancing the secretion of oil. Take a small lauki, wash it and peel it. Then blend it in a blender and extract the juice. Use half-a-cup of lauki juice and mix four spoons of amla powder and two spoons of olive oil. Now apply the paste on the hair strands. Start from the hair roots and work your way to the ends. Wait for about one hour and then wash off with a good quality shampoo. Done at regular intervals, this hair treatment would impart healthy locks. Mix bottle gourd juice and amla juice in equal quantities. Massage this concoction on your scalp to treat dandruff naturally. Mix lauki juice and sesame oil in equal quantities. Apply it on your hair and leave it for two hours. Alternately, you may mix lauki juice with olive oil and apply the mixture on your hair strands. Wait for two hours before you rinse it off. Do it regularly to prevent graying of hair. Grate a cucumber and a bottle gourd. Extract the juice and mix it with besan. Add a spoon of yogurt. Mix thoroughly and apply it on your face. Wait for twenty minutes and wash off with lukewarm water. It is a soothing face pack that gives your skin a squeaky clean feeling and nourishes your skin at the same time. Mix lauki juice with the juice of a tomato in equal quantities. Add a few drops of cucumber juice. Apply this mixture on your face twice daily with the help of a cotton ball. This homemade astringent is known to impart glowing skin and curbing the secretion of excess oil. However, refrain from using this face pack if your skin is allergic to tomato juice. One of the most underrated weight loss aids is the lauki! Treated as an Ayurvedic ingredient, lauki was used by our ancestors in many ways. Bottle gourd or Lauki is known for its low calorie content. It detoxifies and helps the body lose weight quickly. It is alkaline in nature, a great bowel cleanser, and tasty too! And not only can lauki be cooked into a tasty curry it can also be consumed as a juice! While drinking of lauki juice is highly recommended for all the health and beauty benefits it has to offer, you must practice precaution while using it. Drinking bitter lauki juice may pose severe threats. Some of the major effects of drinking bottle gourd juice, which is bitter in taste, include abdominal pain, vomiting and diarrhea. Hence, refrain from drinking bitter lauki juice and in case you happen to drink it by mistake, make sure you visit the doctor as soon as possible. Moreover, you must avoid mixing the bottle gourd juice with any other juice. Lauki juice has innumerable benefits. Since it is easy to lay your hands on bottle gourd and extremely hassle-free to extract the juice, why not use it to your advantage? So, when do you plan to start drinking lauki juice as a part of your regular diet? Or have you started using it? Share with us below in the comments section.